Large, firm, juicy, sweet, nearly black when ripe -- superb flavor, the No.1 cherry. Mid-season. Large vigorous tree. Pollenized by: Black Tartarian, Van, Rainier and in colder climates, Stella . Estimated chilling requirement: 700 hours. Medium-sized, nearly black, sprightly flavor, early season. Vigorous, productive tree. Pollenizer required - interfruitful with all popular sweet cherries. Estimated chilling requirement: 700 hours. Late-ripening tart cherry for cooking, sometimes eaten fresh when fully ripe. Dark red to nearly black fruit with dark juice. Small, round-headed tree with drooping branches (easy to harvest). European origins obscure, introduced to America prior to 1862. Estimated chilling requirement: 500 hours or less. Self-fruitful. From Canada. Self-fruitful, dark red sweet cherry. Large, firm, good flavor. Similar to Van in color. Sometimes sold as "Self-fertile Bing." Ripens 4 days after Bing. Estimated chilling requirement: 500 hours or less. Sour Cherry.Large, light red skin, yellow flesh. Perfect for cobblers, pies, etc. Extremely winter hardy. Very heavy bearing. Self-fruitful. Estimated chilling requirement: 500 hours. Sour Cherry. Attractive, densely foliated, naturally small tree grows to about 8-10 ft. Hardy to 40°F, very productive, resists cracking and brown rot. Often bears in second year. Large, meaty, tart, red skinned fruit with red juice. Excellent for pies and cobblers, also used fresh when fully ripe. From Minnesota, introduced in 1950. Estimated chilling requirement: 500 hours or less. Self-fruitful. Large, yellow with red blush. Sweet and flavorful - superior to Royal Ann. Very cold hardy. Mid-season harvest. Pollenizer required-interfruitful with Van, Lambert, Black Tart, Bing. Estimated chilling requirement: 700 hours. 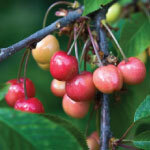 Long-time favorite yellow sweet cherry for eating fresh or canning. Pollenizer required. Interfruitful with Van and Black Tart, not Bing. Estimated chilling requirement: 700 hours. Large yellow cherry with slightly more red blush than Rainier. Excellent flavor, taste test winner. Ripens early, about 3 to 5 days ahead of Rainier. Pollenized by Bing, Black Tartarian and Lapins. Estimated chill requirement: 500 hours. Self-fruitful - no pollenizer needed. Large, nearly black, richly flavored sweet cherry. Similar to its parent, Lambert. Late harvest. Pollenizes Bing, except in mild winter climates. Estimated chilling requirement: 400 hours. Large, bright red fruit with good flavor. Precocious tree requires pruning to prevent size problems. Self-fertile. Matures 5 – 7 days after Lapins. Developed in Summerland, British Columbia. Plant patent applied for. Best sweet cherry, according to Utah folks. Larger, firmer, more flavorful than Bing or Lambert. Good canner. Does not double. Pollenizer required — Bing, Lambert, Rainier, Van. Estimated chilling requirement: 800 hours. Very cold hardy, reliable, heavy bearing. Fine fruit, similar to Bing, though usually smaller. Pollenizer required - interfruitful with all popular sweet cherries. Good pollenizer for Bing. Estimated chilling requirement: 700 hours.